Nestled in the foothills of the Southern Drakensberg is the small village of Himeville from where the Sani Pass 4 x 4 drive trail starts to climb into the mountain Kingdom of Lesotho, This spectacular Pass was once nothing more than a vague footpath used by "Bushman", later the Pass became the main trading route for the early traders, missionaries and travelers. The Pass climbs to an altitude of 2874 m and zig - zags upwards beneath towering cliffs, buttresses and waterfalls. On reaching the Lesotho border post you can have lunch at the highest pub in Africa. 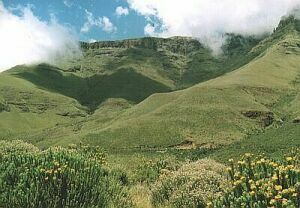 Today the Sani Pass is a protected Wilderness area populated by eland, unique flora and bird life and is the only road into the Southern Drakensberg, the last 8 kms being restricted to four-wheel drive vehicles. "The Mountain Kingdom of Lesotho"
High up in the mountains of Southern Africa is the unique Kingdom of Lesotho, a country not much larger than Belgium, that provides spectacular scenery and offer's the chance to enjoy Africa's majestic beauty, the simplicity of a mountain people and a gentle way of life. 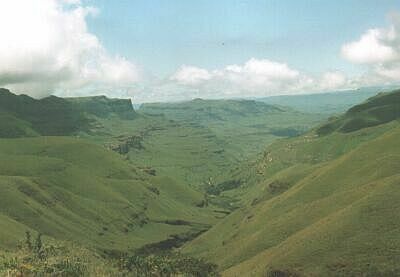 On the eastern side of Lesotho is the 3004m "Cathedral Peak" which gives the area its name, it lies on the eastern end of a spur of mountains which branch off from the main wall. The peaks on this spur include the 2930m Bell, the Outer Horn and the Inner Horn. Of all the summits Cathedral Peak is the easiest to climb. Today this area is preserved as a wilderness area. There is an excellent resort at the foot of Cathedral Peak, with Hotels, a golf course, shop, recreational areas, gardens and organized day walks.